Motorola DROID Turbo 2 certified by GCF? 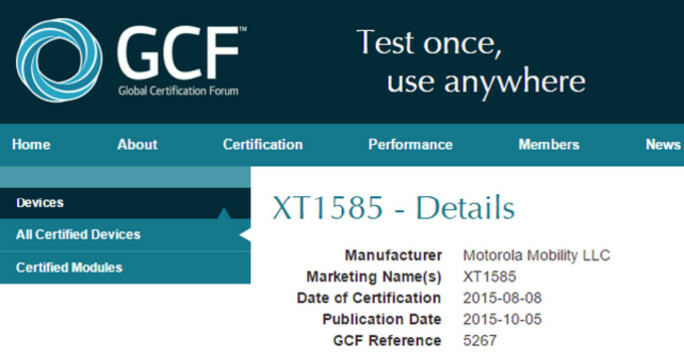 A Motorola handset with the model number of XT1585 has been certified by the GCF. This could be the unannounced Motorola DROID Turbo 2 getting ready to be unveiled. Back in June, the model number was used on a device code named the Motorola Kinzie, which went through the GFXBench benchmark test. At the time, the Kinzie featured a 5.5-inch screen with a 1440 x 2560 resolution. The Snapdragon 810 SoC was under the hood, carrying an octa-core 1.9GHz CPU. 3GB of RAM was inside, and the camera combo front to back was 20MP/5MP. As it turns out, the Motorola DROID Turbo 2 is believed to be a Verizon branded version of the Motorola Moto X Force, which will come with an unbreakable 5.4-inch screen, packing a 1440 x 2560 resolution. Anyone who has held a Motorola DROID Turbo knows that it would take nothing short of an an atomic blast to destroy. Adding an unbreakable display to the package will make it almost indestructible. The rest of the specs rumored for the DROID Turbo 2 include a Snapdragon 810 chipset, 3GB of RAM and 32GB/64GB of internal storage. With a 21MP camera on back, the DROID Turbo 2 sounds like the Kinzie. A 3760mAh battery is expected to be aboard, a small decline from the 3900mAh juicer on the OG DROID Turbo. So it does appear that the XT1585 is the Motorola DROID Turbo 2. An earlier leak from last month said that the phone would be released in October. With the GCF certification now completed, a launch this month seems very possible. At the same time that the DROID Turbo 2 hits Verizon, we could see the Motorola DROID MAXX 2 launched. A Google website recently confirmed that the phone will be a Verizon branded version of the Motorola Moto X Play. My next phone. I think the s6 is the best phone I've ever owned.. it has everything I ever wanted.. besides good battery life. Time to make a change. Fair enough. It charges fairly quickly tho which makes up for it a bit. I can't find a compelling reason to choose this over the X Pure or Nexus 6P. It'll just be bogged down with Verizon bloatware and delayed OS updates. I'm sure it will sell to the masses who have owned Droids before, are tied to VZW, don't know about the MXPE, and don't realize they can escape bloatware and lockdown. And it's good that they'll promote Moto Maker in store. But between the bloat, the 810, and the bezels, I don't think the bigger battery is worth it. There really isn't that much bloatware on Verizon devices. And you just turn them off anyway so you don't even notice they are there 99% of the time. The battery life is huge. And the Turbo is a very solid, tough phone. It's quite compelling. Yes, I was able to disable the crapware on my Droid, but it still bugs me that it's there, taking up space. NFL Mobile? Ingress? If I wanted this crap, I'd install it myself. And Verizon is still sitting on Lollipop and Stagefright updates. I'm done waiting on them. Now that there exist viable unlocked options, I'm through buying through Verizon.